McKinley Elementary School was named for William McKinley, our 25th President. 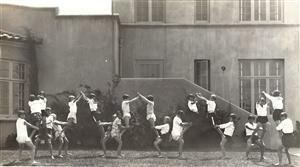 The school was built in 1924-25 and opened for classes on February 2, 1925. The original building was two stories and included thirteen classrooms, the administrative areas and one large room occupied by a branch of the public library. The PTA unit was established in 1926 and Mrs. J.W. Goss was the first PTA president, and Dr. Jay Conner was the first principal. Four more classrooms were built in 1928. During the early years of McKinley School the old cafeteria building and the Greek Bowl were added as part of the school facilities. 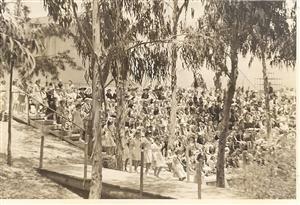 In 1945, the cafeteria, kitchen and auditorium complex plus two additional classrooms were built. In 1950, five of the original teachers were still a valuable part of the staff and helped celebrate the school’s twenty-fifth anniversary. In 1955, McKinley received its first bungalow to help take care of the growing enrollment. The number of bungalows grew to ten by 1972. In 1966, the old cafeteria building was removed, and in March 1973, the original two-story building was demolished to make room for a new earthquake proof building. Richard John Lareau and Associates designed the new building with the loft-open space type classrooms adjacent to a large media center. The new McKinley School building once again opened its doors on April 24, 1975, after a ribbon cutting ceremony. Architect – Richard John Lareau & Associates, Inc. Contractor – Art A. Gussa, Inc.
At McKinley Elementary, Proposition MM funded: a new ten classroom building to replace nine old bungalows; a new lunch court shelter; restructuring of twelve loft classrooms to eight larger primary classrooms; technology infrastructure; moving and refurbishing of five bungalows; improved access for the physically handicapped; campus wide improvements of carpeting, interior painting; landscaping and restroom facilities. The dedication of the new classroom building and lunch court was held Thursday, April 7, 2005.